Based on CanMap Municipality Boundaries, area code boundaries is a graphic representation of Canadian telephone area codes. In the Canadian telephone system, an area code is a three-digit code delineating a “toll” and is distributed according to the North American Number Plan (NANP). Based on CanMap Municipality Boundaries, area code boundaries represent Canadian telephone area codes. 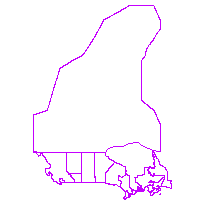 Municipal boundaries were collected up and then dissolved into one boundary for each area code. Edits were made based on notices from: SAIC Canada announcement BC.TEL00.4001.00 and for Ontario Bell Canada announcement CAN.01.24100.01. Edits to the boundaries were made based on realignment with 2001 Census and Canadian Province boundaries.